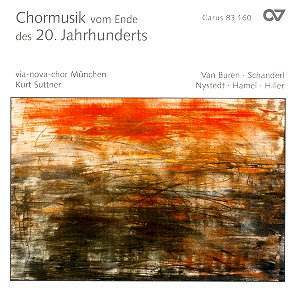 Let me spoil the game straightaway: this is a most interesting, varied and rewarding collection of choral works composed in the last fifteen years or so of the 20th century by composers from various stylistic horizons. The Norwegian-born Knut Nystedt, almost the Grand Old Man here, is represented by his beautifully crafted and inventive Ave Maria composed in 1986 as a chamber concerto for violin and mixed chorus, a somewhat unusual, but quite effective combination. The demanding violin part even includes a cadenza! All the other pieces are by German composers belonging to different generations. The opening item, John Van Buren�s Gloria, is a short setting of just a few lines from the traditional Gloria, worked-out quite effectively in a fairly gentle, melodic way. This is clearly the kind of stuff that should appeal to any choir willing to explore some accessible 20th century repertoire. Hans Schanderl�s setting of Psalm 90 is rather more ambitious in scope, superbly matching the various moods suggested by the text, and again quite rewarding in its own right. "Oh, Erde..." by Peter Michael Hamel is, stylistically speaking, in a rather different league than the other works featured here, in that the idiom is on the whole more modern, but never extravagantly or rebarbatively so. This is a substantial setting of poems by Walter Flemmer and Nelly Sachs as well as of the Lacrimosa section from the Requiem Mass framed by a short section from the Book of Job of which varied restatements introduce and close the work while also serving as an interlude between the Lacrimosa movement (female voices) and Flemmer�s Wir klagen an. The opening statement Oh, Erde... uses quarter tones and glissandi and confronts vibrato and non-vibrato singing to great expressive effect, whereas the interlude setting is somewhat simpler and the epilogue version again relies on somewhat more advance techniques (including whispering and speaking chorus) as well as more traditional singing. These settings, while quite varied in character and vocal technique, aptly reflect the various moods of these often beautiful words. There is no denying the intense and deeply sincere humanity underlying this often moving and strongly communicative piece of music. A major work by any count, but one that does not yield all its secrets easily but rather repays repeated hearings. Wilfried Hiller�s Sappho for female voices, flute and cello was � ironically enough, I think � composed for either children�s or youth choirs; but, needless to say, works perfectly well when sung by professional singers. As a whole, this is however a fairly simple, straightforward work with enough to challenge young singers and to reward singers (and any listener, for that matter). Flute and cello accompany most sections adding some telling instrumental touches while providing for some help at intonation as well. This beautiful, attractive work provides for a fine conclusion to this most desirable release well served by magnificent, well recorded singing. Well worth having.